Who wants to sit inside at a movie theater when you can have your very-own backyard movie night party! With an inflatable movie screen rental from Party Flicks, you don’t have to leave home to enjoy the latest films with friends and family! And the fun doesn’t stop there. You can rent outdoor movie screen and projector equipment for sports events, video game parties, and more – all in the comfort of your own home. Behold the big fight on the big screen on your patio surrounded by family. Get ghoulish horror movies haunting your Halloween party. Whether you’re hosting a celebration or want a mid-summer party to be a night to remember, inflatable movie screen rental from Party Flicks will make it happen. With affordable rates and unbelievable video and sound quality, your movie projector rental will boost your enjoyment and impress your guests. 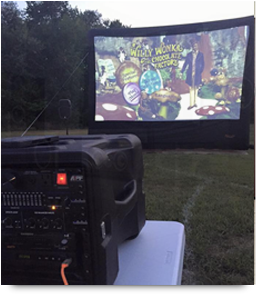 Rent outdoor movie screen and projector equipment with us, and you get options! From a 40-foot inflatable movie screen rental big enough to entertain 150 people to a smaller 120” perfectly suited for your deck or patio, you’ll have the perfect view for whatever you need. And to make your backyard movie night party convenient and stress-free, we’ll set it all up, break it all down, and save you some money on power with our super-quiet generators. It’s time you discovered what a movie projector rental can do for your home, your family and your friends. Take your entertainment to the next level with Party Flicks. Contact us directly via email or call 732-591-8080 for a free consultation and information on inflatable movie screen rental rates.